People get really stressed out about money. Money makes people cry! Money causes people to lose sleep. Money causes marriages to hit the skids. There are way more important things to be stressed about than money. Money is pretty much last on the list of things to be stressed about. On your deathbed, you won’t think, gee, I wish I stressed about money more. This $5 Trillion Market Is Just Getting Started. Don’t miss out on the ETF revolution. Get going with this must-read report from Jared Dillian. So what is the solution to not stressing about money? Drink decaf? Yoga? Meditation? None of the above. And before you ask, the solution to not stressing about money is not having more money. Lots of times, more money causes more stress, not less. In the sage words of The Notorious B.I.G., “Mo’ money, mo’ problems.” The people who stress about money with $10,000 in the bank would be stressed with $1,000,000 in the bank. Let me dispel the myth that the source of money stress is “not having enough.” Nobody stresses about the fact that they can’t afford the $300,000 house that they want. Or that they can’t afford a $1,200 pair of Rick Owens sneakers, or a Lexus, or jewelry, or whatever. People don’t stress about the fact that they have a lower standard of living than they might otherwise want. That isn’t the source of money stress at all. There are two primary sources of stress about money: DEBT and RISK. There are two ways to stress about debt. People borrow too much—mortgages, car loans, etc.—and they have a big monthly nut. All the free cash flow goes to paying debt. There is not much left over, and not much savings. If you lose your job, the merry-go-round stops. You get hurt in a car accident, the merry-go-round stops. People in this precarious situation are acutely aware of their precarious situation. It is stressful, knowing that it could all end at any moment. The other way to stress about debt is that you go upside-down on it, like, when you owe more on your house than it is actually worth, and you will have to pay the bank to move. That is a big source of stress. People feel trapped. They are trapped. I have known people in strong financial positions who have been reduced to tears over debt, and the fear that something might go wrong. That is a pretty terrible way to live. Debt is the source of stress. So… if you want to eliminate stress, eliminate debt! If you are sick and tired of being sick and tired, here’s what you do. Instead of just passively paying the minimum on your debt every month, introduce some austerity in your life, set aside some cash, and start hacking at the principal. It will make you feel better, I assure you. It will make you feel like you are taking action on the problem. And if you work at it, you will eventually be free of debt, and you will be free of any stress that is related to debt. The goal is not to get rich. The goal is to not feel stress! Again, there are billionaires who stress about money—usually because of debt. If you have no money stress, then you are doing better than the billionaires. Don’t miss out on the ETF revolution. 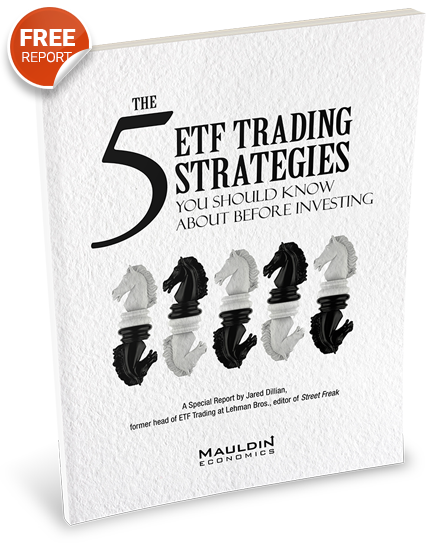 Get going with The 5 ETF Trading Strategies You Should Know About Before Investing, from Jared Dillian. The other source of money stress is risk. Typically, having too much of it. If you had a 50% decline in the value of your portfolio, would it cause you stress? It happened to me during the financial crisis. My net worth got cut in half. My LEH stock vaporized and I lost some money on my investments. It caused me stress. I was still wealthy by most people’s standards—but it is a kick in the nuts when you get cut in half. It didn’t feel good. There was nothing to be done about the LEH stock, but if I had a more conservative portfolio I would have had less stress. Take a look at your portfolio. Try to compute the chance that you will get cut in half. If you think this is even remotely possible, then it is time to take action to eliminate risk. This is the main reason I recommend the 35/65 portfolio. Not because it will provide you with any kind of amazing returns. 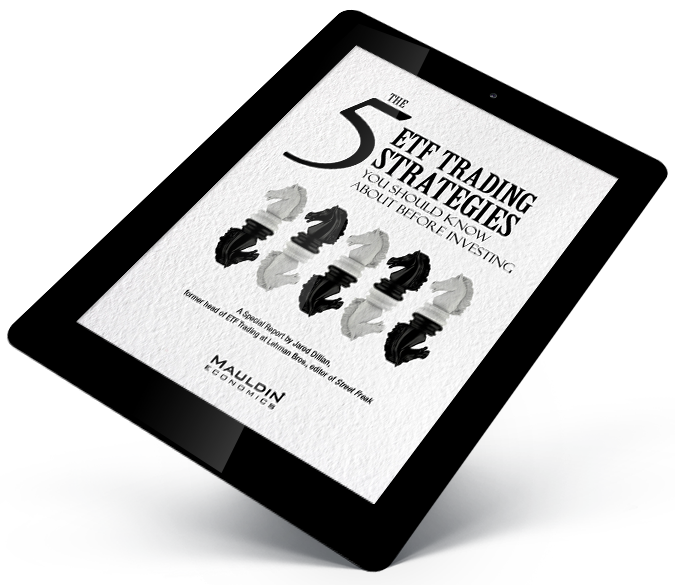 The 35/65 portfolio will allow you to sleep soundly at night. If your portfolio is 100% stocks, you have too much risk. If your portfolio is 80% stocks, you have too much risk. If you’re speculating in crypto and cannabis, you might have too much risk. Let me ask you a question: was there a moment you were worried during the recent 20% correction? Were you a tiny bit scared? If the answer is yes, then you have too much risk. Believe it or not, I’m not in the money business. I’m in the happiness business. If you make a lot of money, but you are miserable, I would not characterize that as winning. If you eliminate debt, and you minimize risk, you will be happy. That is all I care about. Getting rich is great, but is simply extra credit. Tickets are now available for this year’s Strategic Investment Conference, which takes place in Dallas from May 13—16. I strongly recommend that you get your ticket as soon as possible. When you see the lineup, including one home-run guest speaker, you’ll understand why I think it’s going to have a “sold out” sign hung up really fast. I’m told seats are already selling quickly. And apart from the amazing lineup, and the fact that SIC is always a terrific few days, you can get a large discount on the ticket price if you register now. If you can make some time to come, it really is worth it. I always enjoy getting to meet lots of readers there, so if you want to hang out, check out the details here. Jared, I totally agree with you, and larryjohnson below. I’ve always been a cheapf**k, and enjoyed little financial stress. In retirement, I feel like “I won” and should know when to fold my cards. (Well, a few side bets for fun, but nothing to lose sleep over.) Thank you for your contrarian advice. I wonder how much you agree with John M about timing and the next crash? we all should have learned in secondary school. Great article and great advice..for me, you hit the nail right on the head. I used to have both worries you mention, debt and risk, and have long taken care of the debt part (free at last! ), but the risk in our portfolio shot up dramatically last November with a company we were quite heavily invested in with bonds and some common stock, one that you mentioned several months ago in one of your letters, GE. Like many, I always loved the company, their businesses, and products…..good solid businesses. In November, with the re-organization going on, the BAA+ ratings for the bonds, etc, and it took alot of research, thought, and finally with your letters, the ultimate decision to do something. In short, we’re out of GE and into nice safe treasuries and CD’s paying an average of 3.55%. Markets plunge 800 points, our stuff goes UP, and if that isn’t enough to make me sleep good at night now, nothing is. I also agree with you totally about your asset allocation….your age in fixed income, the rest in stocks or other investments. My age is 75, and I invest like I"m 85. We don’t need more, we just need to keep what we have and earn a little to boot. Your advice is exactly appropriate. Keep up the good work.